Wise, brilliant and funny, Fran Lebowitz hit the New York literary scene in the early '70s when Andy Warhol hired the unknown scribe to write a column for Interview magazine. Today, she's an acclaimed author with legions of fans who adore her acerbic wit. "Public Speaking" captures the author in conversation at New York's Waverly Inn, in an onstage discussion with longtime friend and celebrated writer Toni Morrison and on the streets of New York City. 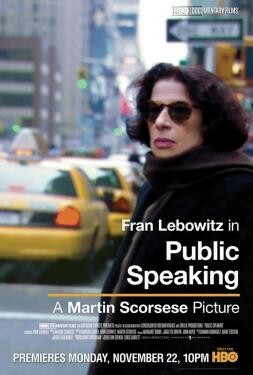 Lebowitz offers insights on timely issues such as gender, race and gay rights, as well as her pet peeves, including celebrity culture, smoking bans, tourists and strollers. Of her beloved city, she says, "New York was not better in the '70s because there was more crime. It was better because it was cheaper."